Deciduous shrub with very finely divided, filigree foliage of deep burgundy-black leaves. 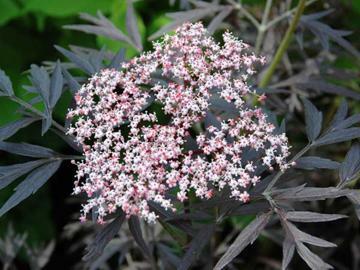 Creamy pink flowers in spring, followed by dark red-black berries in late summer. Moist well drained soil in sun or part shade. Tolerant of a wide range of conditions and easy to grow. Prune back hard in early spring. Softwood or hardwood cuttings, in spring or late autumn. Good garden plant, easily trained and can be used for similar effect as Japanese Maples, but more tolerant of adverse conditions. Bred by the Horticultural Development Council and Horticulture Research International, East Malling, UK, introduced 2003.